"Christmas 2018" DROPS-Along - Clue #1 - Let’s run with Rudolph! Clue #1 - Let’s run with Rudolph! 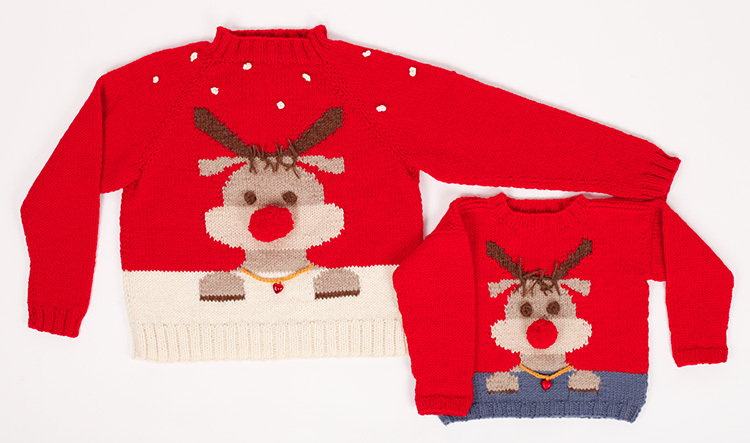 Christmas is approaching and that means it’s time to get started on new holiday jumpers for the whole family! 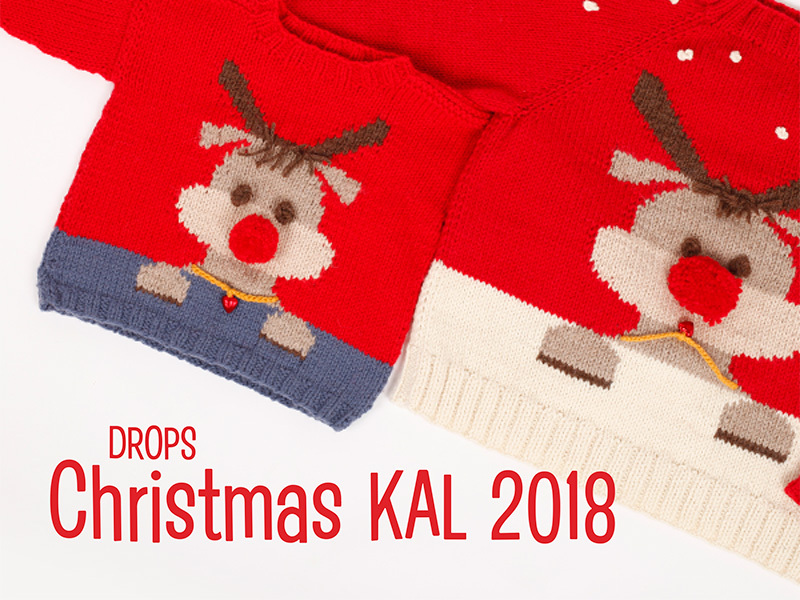 So what better than joining us and knitting together these cute Rudolph jumpers in DROPS Nepal - the yarn has 30% discount the rest of the year! Still missing the materials to knit the jumper? See a list of what you need here. Already got the yarn? Then keep reading and join us working on the back piece! Hesitating about your skills? Remember that our clues and accompanied by tutorial videos where we show you how to cast on, how to knit a rib, how to knit garter stitch, and so much more. We will try to make sure that everyone can do this! 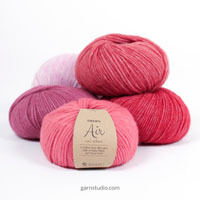 One last thing before we start - do you know what size you want to knit? You'll find both patterns (with and without the reindeer on the back) below, just make sure to follow the same one on every clue, they are not exactly the same. 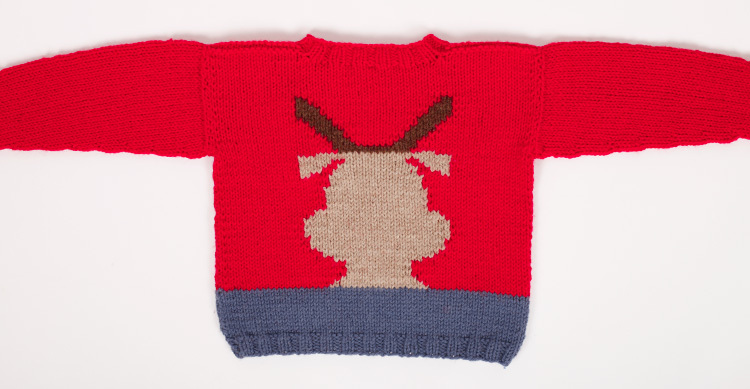 You can make this jumper with or without the reindeer in the back, just choose your favourite option! You’ll find both patterns below. Back piece is worked back and forth with circular needle from the bottom to the top. Cast on 54-58-62-66-70-74 stitches (including 1 edge stitch on each side) with circular needle size 4 mm and denim blue (colour b). Purl 1 row (= wrong side). The next row is worked as follows from the right side: 1 edge stitch in GARTER STITCH – read description above, * knit 2, purl 2 * work from *-* until there is 1 stitch left on the row and finish with 1 edge stitch in garter stitch. Continue this rib for 2-2-2-3-3-3 cm – adjust so that the next row is from the right side. Change to circular needle size 5 mm. Work 10-12-14-16-20-24 rows stocking stitch with 1 edge stitch in garter stitch on each side. REMEMBER THE KNITTING TENSION! Change to red (colour a) and continue with stocking stitch and 1 edge stitch in garter stitch in each side. When the piece measures 21-23-26-29-32-35 cm cast off 1 stitch at the beginning of the next 2 rows for armholes = 52-56-60-64-68-72 stitches. Continue with stocking stitch and 1 edge stitch in garter stitch on each side. When the piece measures 31-34-38-42-46-50 cm cast off the middle 18-20-22-24-24-26 stitches for neck and each shoulder is finished separately. Then cast off 1 stitch on the next row from the neck = 16-17-18-19-21-22 stitches left on shoulder. Continue working until the piece measures 32-35-39-43-47-51 cm – adjust so that the next row is worked from the wrong side. Knit 1 row from the wrong side, knit 1 row from the right side and knit 1 row from the wrong side. Cast off with knit from the right side. Work the other shoulder in the same way. The jumper measures approx. 33-36-40-44-48-52 cm from the shoulder down. The reindeer is worked in stocking stitch. To avoid long strands at the back of the piece when working pattern, you can work with 3/5 balls. In other words, work with 1 ball of red (colour a) on each side of the reindeer and 1 ball of the pattern colour in the middle. To avoid holes when changing colour, twist the strands together when changing colour. Cast on 54-58-62-66-70-74 stitches (including 1 edge stitch in each side) with circular needle size 4 mm and denim blue (colour b). Purl 1 row (= wrong side). The next row is worked as follows from the right side: 1 edge stitch in GARTER STITCH – read description above, * knit 2, purl 2 * work from *-* until there is 1 stitch left on the row, finish with 1 edge stitch in garter stitch. Continue this rib for 2-2-2-3-3-3 cm – adjust so that the next row is from the right side. 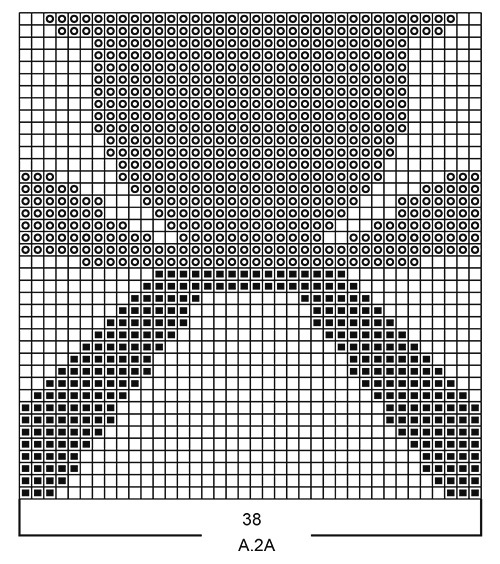 Change to red (colour a) and work the next row as follows from the right side: Work 1 edge stitch in garter stitch, 13-15-17-19-21-23 stitches in stocking stitch, work A.1 (= 26 stitches) – read PATTERN, work 13-15-17-19-21-23 stitches in stocking stitch and finish with 1 edge stitch in garter stitch. Continue this pattern. When the piece measures 21-23-26-29-32-35 cm cast off 1 stitch at the beginning of the next 2 rows for the armholes = 52-56-60-64-68-72 stitches. Continue with stocking stitch and A.1. When A.1 has been completed, continue with red (colour a) over all stitches. When the piece measures 31-34-38-42-46-50 cm cast off the middle 18-20-22-24-24-26 stitches for neck and each shoulder is finished separately. Then cast off 1 stitch on the next row from the neck = 16-17-18-19-21-22 stitches left on shoulder. Continue working until the piece measures 32-35-39-43-47-51 cm – adjust so that the next row is worked from the wrong side. Knit 1 row from the wrong side, knit 1 row from the right side and knit 1 row from the wrong side. Cast off with knit from the right side. Work the other shoulder in the same way. The jumper measures approx. 33-36-40-44-48-52 cm from the shoulder down. 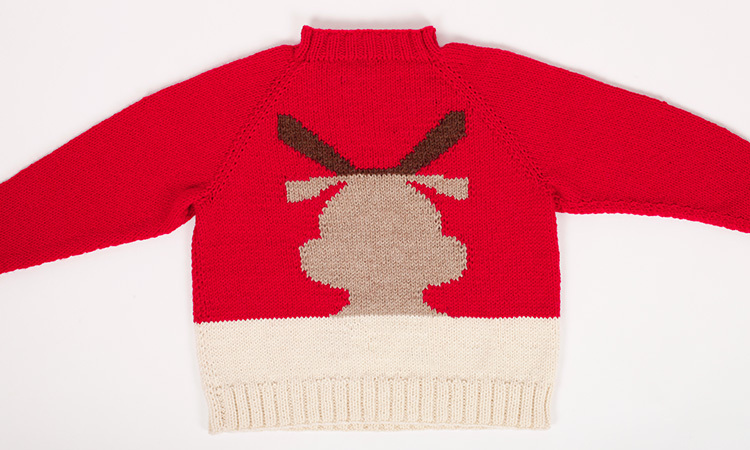 You can make this jumper with or without the reindeer showing in the back. Choose below which of both options to follow. Work 1 edge stitch in garter stitch, knit 1, 1 yarn over, work until there are 2 stitches left, 1 yarn over, knit 1, 1 edge stitch in garter stitch. On the next row, purl the yarn overs twisted to avoid holes. Then work the new stitches in stocking stitch. The piece is worked back and forth, top down, with circular needle and with raglan increases. Cast on 28-30-32-34-36-38 stitches (including 1 edge stitch in garter stitch on each side) with circular needle size 5.5 mm and red (colour a). Purl 1 row from the wrong side. Then work stocking stitch with 1 edge stitch in garter stitch on each side. At the same time on the first row from the right side increase 1 stitch on each side to raglan - remember INCREASE TIP. Increase like this every 2nd row a total of 20-21-23-25-27-29 times = 68-72-78-84-90-96 stitches. When all the increases to raglan are finished, the piece measures approx. 20-21-23-25-27-29 cm. At the end of the next 2 rows cast on 4-5-5-5-7-9 stitches for the armhole on each side of the piece = 76-82-88-94-104-114 stitches. THE PIECE IS NOW MEASURED FROM HERE! Continue with stocking stitch and 1 edge stitch in garter stitch on each side. When the piece measures 18-17-16-15-14-12 cm continue with off white (colour b) to finished length. When the piece measures 25-25-25-25-25-25 cm, increase 16-18-20-22-24-26 stitches evenly on row = 92-100-108-116-128-140 stitches. Change to circular needle size 4.5 mm and work rib as follows from the right side: 1 edge stitch in garter stitch, (knit 2, purl 2) until there are 3 stitches left on the row, knit 2 and 1 edge stitch in garter stitch. Continue like this until the rib measures 6 cm. Cast off with knit over knit and purl over purl. The back piece measures 51-52-54-56-58-60 cm from the neck down. See diagrams A.2a & A.2b. 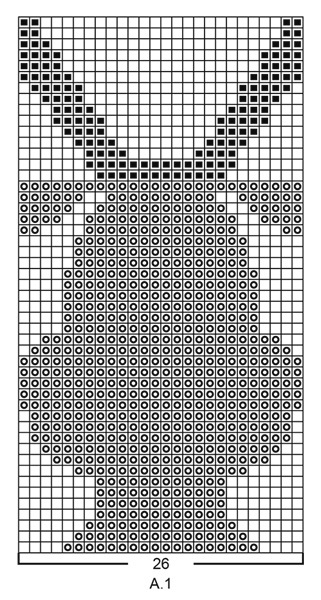 Diagrams A.2a and A.2b (reindeer back): The whole diagram is worked in stocking stitch. Work with 3/5 balls so you avoid long strands on the wrong side. In other words, work with 1 ball red (colour a) on each side of the jumper and 1 ball of the pattern colour in the middle. NOTE: To avoid holes when changing colours, twist the strands together. Cast on 28-30-32-34-36-38 stitches (including 1 edge stitch in garter stitch on each side) with circular needle size 5.5 mm and red (colour a). Purl 1 row from the wrong side. Then work stocking stitch with 1 edge stitch in GARTER STITCH - read description above, on each side. At the same time, on the first row from the right side increase 1 stitch on each side for raglan - read INCREASE TIP. Increase like this every 2nd row a total of 20-21-23-25-27-29 times = 68-72-78-84-90-96 stitches. REMEMBER THE KNITTING TENSION! 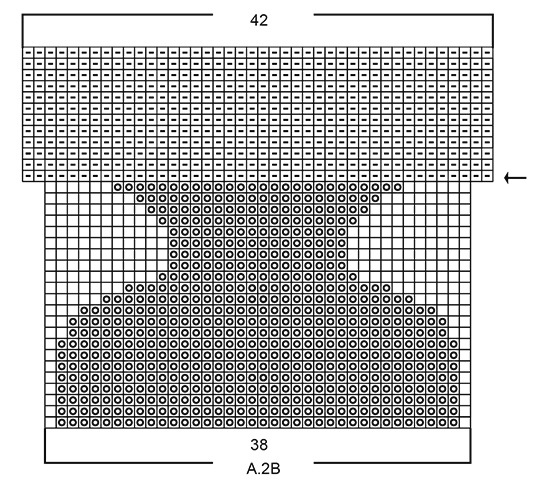 AT THE SAME TIME when you have increased 7-7-8-9-10-10 times on each side and there are 42-44-48-52-56-58 stitches on the needle, work pattern as follows: 1 edge stitch in garter stitch, knit 1, 1 yarn over (= increase), knit 0-1-3-5-7-8, work A.2a (= 38 stitches) - read PATTERN above, knit 0-1-3-5-7-8 stitches, 1 yarn over (= increase), knit 1 and 1 edge stitch in garter stitch = 44-46-50-54-58-60 stitches. When all the increases to raglan are finished, the piece measures approx. 20-21-23-25-27-29 cm. At the end of the next 2 rows cast on 4-5-5-5-7-9 stitches for the armhole on each side of the piece = 76-82-88-94-104-114 stitches. THE PIECE IS NOW MEASURED FROM HERE! 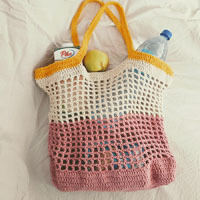 Continue with stocking stitch, pattern and 1 edge stitch in garter stitch on each side. When A.2a has been completed, work A.2b over A.2a. When you see the arrow in A.2b, continue with off white (colour b), stocking stitch and 1 edge stitch in garter stitch on each side until the piece measures 25-25-25-25-25-25 cm. Now increase 16-18-20-22-24-26 stitches evenly on row = 92-100-108-116-128-140 stitches. Change to circular needle size 4.5 mm and work rib as follows from the right side: 1 edge stitch in garter stitch, (purl 2, knit 2) until there are 3 stitches left on the row, purl 2 and 1 edge stitch in garter stitch. Continue like this until the rib measures 6 cm. Cast off with knit over knit and purl over purl. The back piece measures 51-52-54-56-58-60 cm from the neck down. Now we are done with the back! Come back next week to work together on the front of the jumper! Here’s a list of resources to help you with the back of the jumpers! Materials Subscribe to the clues! Bonjour, j'aimerai comprendre, lorsque vous dites 16 rangs jersey est ce qu'il s'agit de 16 rangs aller et 16 rangs retour soit 32 rangs ou 16 rangs aller-retour. Merci de votre réponse. Bonjour Mme Jaulin, quand on tricote 16 rangs, on compte le nombre total de rangs, soit 8 sur l'endroit et 8 sur l'envers. Bon tricot! Børnetrøje med rensdyr på bagstykke. Når jeg strikker gevir blir garnet trukket over rigtig mange masker imellem højre og venstre gevir. Jeg har kun et nøgle i den farve. Det blir ikke pænt. Kan jeg dele garnnøglet i 2 og så strikke som jeg har gjort med det røde garn efter jeres anvisning? Hej Gitte, ja det er en god ide at dele nøglet op i 2 og så strikke hvert gevir med et eget nøgle. God fornøjelse! Can you please let me know when the front will be available. , Completed the back it looks great !! Dear Mrs Arnold, all clues are now avalaible - see them there. Happy knitting! Hi I don't know which size should I choose, I want the sweater to fit me a little loose, I'm 160 cm in height, I weight 54 kg, 90 cm in bust and 67 in wais, tnak you! Hi I want to make the adult sweater but I don't know which size to choose, I want it to fit me a little loose, I regularly wear medium, I'm 160 in height, weight 53 kg, bust 90 and waist 67, please help me, thank you!!! Dear Karin, you will find the finsihed measurement chart in each size here - Measure a jumper that fits you - or whoever will wear it - and compare those measurements with our size charts to choose the best fit. Read more about how to choose a size here. Happy knitting! 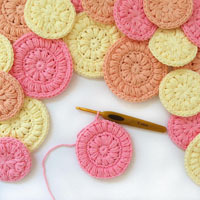 Goodmorning, I would like to know if I can use also the single pointed needles or the scheme is suitable only for the circular? Dear Sarah, you can use straight needles for back and front piece - you may then just have to adjust the pattern in the next clues - read more about adjusting a pattern onto straight needles here. Happy knitting! Buongiorno Barbara. Il diagramma va seguito anche sui ferri di ritorno. Buon lavoro! Hi! I would like to make this jumper as a vest, with no sleeves. Could you point me possibly to some existing pattern that I could follow to make it without sleeves (decreasing/cast off for the arms, and making a rib for the armhole). thank you. Hi Ana! You can follow the same pattern here, just make about 4 edge stitches in garter stitch at armhole edges and decrease inside of them. Happy knitting. Hallo, Ik wil deze trui maken voor een baby van maand, nu zal ik moeten omrekenen maar ik kan geen stekenverhouding vinden in het patroon? Ik heb de wol al wel binnen. Heb ik wel genoeg wol als ik de draden mee laat lopen i.p.v. bolletje voor en na het rendier? De stekenverhouding kun je hier vinden (stukje naar beneden scrollen bij andere materialen). Het verschil in verbruik van garen als je de draden mee laat lopen is niet heel erg groot, maar je hebt natuurlijk wel ietsje extra nodig. Jeg får det ikke til å stemme. Jeg er ferdig med økningene og har 84 m på pinnen, MEN arbeidet måler kun 22 cm når det burde vært 25. Hva kan jeg gjøre? Hej, Hvis dine pinde ikke fylder helt lige så meget som den strikkefasthed vi har angivet i opskriften, så vil arbejdet blive lidt kortere. Du kan jo evt strikke de sidste 3 cm ensfarvet. God fornøjelse! Liebe Hannah, hier stricken wir zuerst nur der Rückenteil, Hals wird später gestrickt. Viel Spaß beim stricken! Hoi, het telpatroon , is dat alleen de goede kant van het werk of zijn de heen en teruggaande naalden . Dus asn de averechtse kant tel ik verder? Het telpatroon laat alle naalden in het patroon zien, dus zowel de heengaande als de teruggaande naalden zijn in het telpatroon opgenomen. Op de goede kant lees je het telpatroon van rechts naar links en op de teruggaande naald lees je de rij daarop weer terug, van links naar rechts. Jeg synes bestemt det ser ud som der er strikket rib i halsen, men det fremgår ikke af opskrift på bagstykke voksen?? ?